In a sense, this is not surprising. In nature, after all, creatures – and at the more basic level, structures, such as receptors and their ligands – have been co-evolving for billions of years. With that sort of a track record, it is at first blush surprising that the pharma industry is turning away from natural products. But there are several reasons for this, both on the screening and the synthesis side. The problems start with screening. Any natural product usually co-exists as part of a mixture – a mixture with, in many cases, quite similar molecules. To identify exactly which of a related group of molecules is having an effect can be like looking for a needle, not so much in a haystack as in a box full of almost identical needles. Then, assuming a compound has been purified and identified, the question becomes where to get enough of it for clinical use. Chemotherapy drug taxol is the most famous example – before a semisynthetic route to create it was discovered, the only way to get enough of it seemed to be the wholesale destruction of the yew tree, the plant from whose bark it was first isolated. Plants that produce the podophyllotoxin (see below) are on the endangered species list. The best way to make use of the diversity and long evolutionary history of optimization, then, is to use natural products as a starting point, and build up chemical libraries based on natural product motifs. One example for the advantages of such an approach is podophyllotoxin, a non-alkaloid toxin lignin extracted from the roots and rhizomes of plants like the American Mayapple and Berberidaceae. Podophyllotoxin is used for the topical treatment of genital warts and claims three widely used chemotherapies as its derivatives: etoposide and its prodrug etoposide phosphate, and teniposide. Before those derivatives, though, the drug has had a thousand-year-history in Southeast Asia, where plants producing podophyllotoxin have long been used to treat genital warts and tumors, as well as a variety of other ailments spanning the critter-induced (snake bites and intestinal worm diseases) and beyond (skin disorders, coughs). Despite those successes, though, podophyllotoxin has failed in modern clinical trials, and it can be highly toxic in excess. For this reason, interest in compounds that are just similar enough to share its positive effects, and just dissimilar enough to improve on those effects, mitigate its toxicity, or ideally, both, are in high demand. 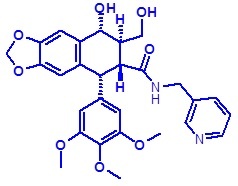 Chemists have made untold numbers of derivatives of podophyllotoxin since etoposide was successfully developed. A 2014 review listing only “recent progress” in modifications at one particular atom – the same C4 atom where modifications gave rise to etoposide and teniposide – reported more than 700 structures. Another review focused on its derivative deoxypodophyllotoxin. For now, however, the podophyllotoxin’s promise remains open. ChemDiv has developed an approach to the synthesis of of podophyllotoxin derivatives based on its lactone ring cleavage with primary and secondary amines. The library synthesized via this approach will be included in several of ChemDiv’s libraries, including nature-like compounds and PPI modulators. Oftentimes, natural products can be very complex to synthesize – one issue that can keep them from being more fully explored. While polypeptides, nucleic acids and oligosaccharides are synthesized using a building block approach, natural products and their derivatives are still deconstructed one at a time, and the routes to their total synthesis can be mind-boggling in their complexity. Researchers from the University of Illinois at Urbana-Champaign have recently made progress in simplifying the chemical synthesis of natural products. Martin Burke and his team believe that synthesizing natural products can be approached in a way that is analogous to the synthesis of polypeptides, long strings of DNA or RNA, and oligosaccharides – by using a simple set of building blocks and a few basic reactions to generate diversity. In the May 11, 2014, issue of Nature Chemistry, Burke and colleagues demonstrate that their approach works for synthesizing the majority of polyenes – organic compounds with alternating single and double bonds between the carbon atoms in their backbone. In their work, the authors first identified a set of about 2,800 polyene compounds from the Dictionary of Natural Products, a listing of the chemical structure of all known natural products that aims to be comprehensive and contains close to a quarter of a million structures. They found that they were able to synthesize roughly three quarters of those structures using a dozen starting blocks and a single reaction. “With just 12 different building blocks, you can make thousands of different natural product-like structures in a very efficient and very flexible way,” Burke summarized the findings in a video released by the University of Illinois. The imagery of legos is irresistible to explain his approach, and in the video, Burke uses legos to demonstrate the idea of different building blocks that can always be coupled in the same, simple way to make unlimited shapes. In their paper, the researchers point out that they have synthesized slightly more than one percent of all known natural products. Whether that’s a lot or a little depends on your perspective, of course. But Burke and his team have their sights set on the other 99 percent – in their paper, they note that in the course of identifying building blocks for polyenes, they have identified another dozen motifs, or lego bricks, that are present in more than 100,000 of the products in the Natural Product Dictionary. And the same methods that the team used to synthesize natural products could be used to synthesize natural-inspired products – molecules that are not found in nature but could nevertheless have pharmacological properties.